Can I load in RSTAB or RFEM z. B. from a multi-layer floor structure? 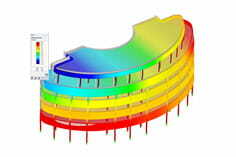 In RFEM and RSTAB it is possible to generate loads from a multi-layer structure. The multi-layer construction library already contains some floor and roof structures. This library can be edited and expanded as desired. This load type can be used, among other things, for area loads and generated loads. So that it does not have to be recreated by every employee in a company, it is possible to distribute the file in which user-defined structures are stored to other computers. For this, the file "MultiLayer_User.db3" must be copied to the same directory for the multilayer library on the new computer. You can check this by displaying the respective database directories in the "Program Options".